Gardeners of all ages will be inspired by this gleeful, whimsical book about the joys of planting seeds EVERYWHERE! Along with their radical re-envisioning of our urban landscape, John and Jana offer solid seed-starting advice and all of it charmingly illustrated. In these colorful pages, happy little Gorilla Gardener shows us how by secretly dropping seeds in sidewalk cracks to sprout flowers and green the city. 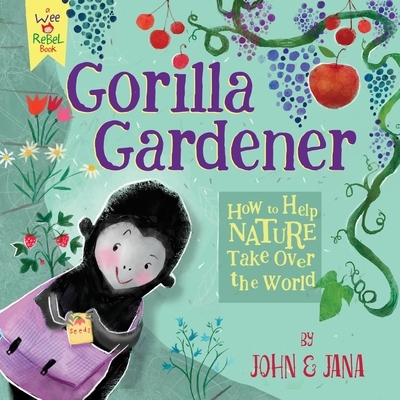 Gorilla Gardener goes even farther, building a delightful world where nature rules and humans of all ages enjoy life outdoors, while having creative fun and adventure With instructions for making your own seed-burst, with a glossary of gardening terms. John Seven is a writer and Jana Christy is an illustrator, both avid gardeners living together in Western Massachusetts. As a team, they co-authored the critically acclaimed children's books A Rule Is To Break: A Child's Guide to Anarchy (Manic D), as well as Happy Punks 123 (Manic D) and Frankie Liked to Sing (Abrams).